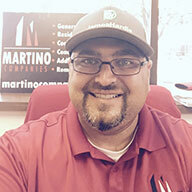 Martino Home Improvements Puts You First! We provide the highest quality service and value for your money… Period. Martino Home Improvements delivers the highest quality workmanship, materials, and hardware. Families all over Michigan have trusted us with their homes for more than 30 years. It’s the way my Grandfather did it; it’s the way my father did it; and by God, that is the way we will always do it. Our Commitment to You: If it isn’t PERFECT, it isn’t DONE. We promise the BEST REMODELING EXPERIENCE you will ever have. Absolutely NO NICKEL & DIMING after you sign the contract. Since my grandfather started in this business in 1986, we have been delivering expert craftsmanship for new roofs and roofing repair, beautiful custom walkways and driveways, durable siding, gutters and windows as well as interior home improvements you are proud to show your neighbors. We are union-schooled contractors and take pride in our work. We guarantee 100% satisfaction and are so confident in our work, we re-inspect it EVERY 2 YEARS. If we see a problem- we fix it, FREE OF CHARGE! How many contractors offer that?